Place rolls on a baking sheet. Brush with beaten egg and sprinkle with Parmesan cheese and Italian seasoning. Bake for 5 to 7 minutes or until lightly browned. Season mushrooms with salt and pepper. Grill rounded side up over medium heat for 5 minutes. Turn and top with cheese and peppers or tomatoes and cook for 5 minutes more or until cheese is melted. Cut rolls open and place equal amounts of arugula on roll bottoms. 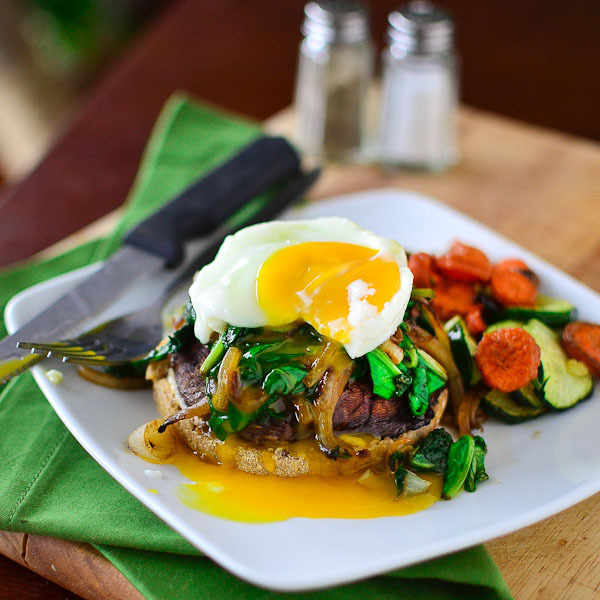 Top with mushrooms and fried eggs; sprinkle with basil and top with roll tops.